Today we’d like to introduce you to Roy Silverstein. Roy, please share your story with us. How did you get to where you are today? Back in the ’90s, like many high school kids, I was in a completely insignificant band that meant the world to me. We had this dinky cassette recorder that we would set randomly in my parents’ basement where we practiced in the suburbs of Chicago. Needless to say, it didn’t sound anything like the bands we loved; it sounded downright awful! I was enamored with the records of the time, and I dreamed of unlocking their secrets. Luckily, the drummer’s father was a working musician who just happened to have an extra four-track recorder lying around. I dove in head first, teaching myself how to use this now primitive machine. I transformed the basement into a make-shift studio. It was very DIY, but that was the ethos of the time, and it worked. Ironically, that band broke up before we had a chance to record, but by senior year I was in three bands, and I recorded two of them plus a band that my other friends were in. I became really obsessed with the process, the creative aspect of it, as well as the technical side of things. After high school, I went to the University of Miami where they had a special program called Audio Engineering. This was actually a full Electrical Engineering degree with an emphasis in audio. My brain was being filled with the fundamentals of sound, acoustics, electricity, circuit design, and both analog and digital recording technology. Every summer I tried to apply what I was learning by recording more music back home with my friends. When I graduated in 2001, I landed a job in San Diego with Qualcomm, where I helped develop audio chips for cellphones. I moved into a beautiful old Craftsman in Golden Hill and put together a new DIY recording setup, dubbed The Habitat. I joined two bands, expanded my solo project, and recorded as much as possible. I also started putting on free underground house shows twice a month. In some ways, I was living a double life. By day I worked this very technical, corporate job and by night I was exercising the more imaginative aspects of my mind with music. The house was a very creative space and a source of inspiration in and of itself. My roommates were dancers, artists, musicians, and videographers. The Habitat became fairly well known in the music community as a place to see some amazing music in an intimate setting. I think there was a real sense of community formed there. I also made some great records and improved my recording skills by leaps and bounds. It was a very seminal period in my life. The Qualcomm job was allowing me to buy more gear, but at some point, I could tell that my biggest limitation was really the space I was recording in. As wonderful as The Habitat was, there was no sound isolation, and the acoustics were not right for accurate monitoring. Recording is a lifelong pursuit, but my progress started to plateau, and something had to be done. After ten patient years of saving, I finally had enough to buy a place and build out a studio. In August of 2010, I secured a property in North Park with room to build and zoning that allowed for a home occupied business. I then began talking with studio designers and really gelled with Wes Lachot, an incredible acoustician/architect from North Carolina. After two years of design, permitting, and getting bids from contractors, I was ready to break ground. After another year of construction, the studio was finally complete, and Rarefied Recording was born! 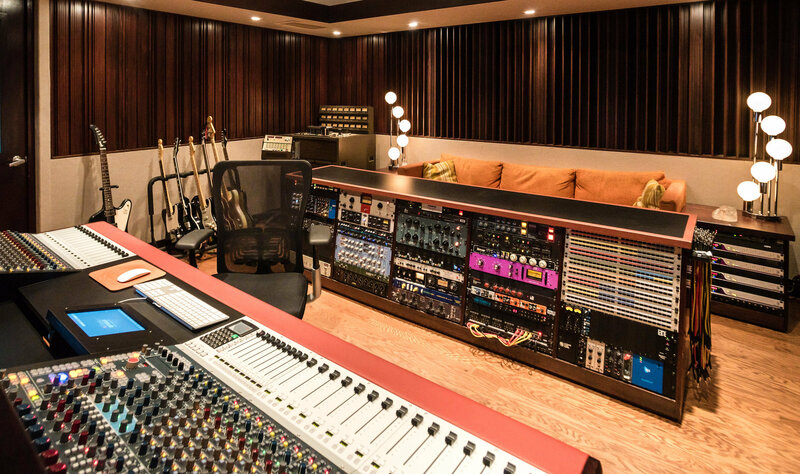 When I listened to music in my new control room, it was like hearing for the first time. Word of the studio spread organically, and after two years things had grown to a point where I felt like I could make a go at running the studio and engineering/mixing/etc. full time. So in September 2015, I said goodbye to Qualcomm and went 100% full time at the studio. This was a pretty big deal because I honestly didn’t know if I could make it work as a full-time gig or if it would be more of a side job/hobby forever. Rarefied is now over five years old, and there has been a continual, slow and steady growth in business. My plan is to just keep it going and improve things more and more as time goes on. Meanwhile, I keep developing my skills as a recording engineer. There are many secrets still to unlock. There have definitely been some obstacles and challenges along the way. It actually all started back when I was trying to secure the property. It turns out there’s nothing short about a Short Sale, especially when the sellers have two mortgages with different lenders! It took nine months to close on it, and I nearly gave up, but it all worked out in the end. Getting the studio design through the City was also challenging. You have to jump through a lot of hoops, and it really adds a lot of time and expense to the project. After being made to do some funny things like a soil analysis, I finally passed through all the red tape, and the project could break ground. During construction, there were problems too. Mistakes were made and had to be fixed. The schedule kept expanding, and the budget kept growing for one reason or another. It was a stressful time trying to make sure everything was being done right. It’s very easy for a contractor or a sub-contractor to think that their normal way of doing things will be fine, when in fact it can totally ruin the acoustic isolation you’ve been trying to achieve. But in the end, everything was caught, and the studio performs wonderfully. Rarefied Recording – what should we know? What do you guys do best? What sets you apart from the competition? 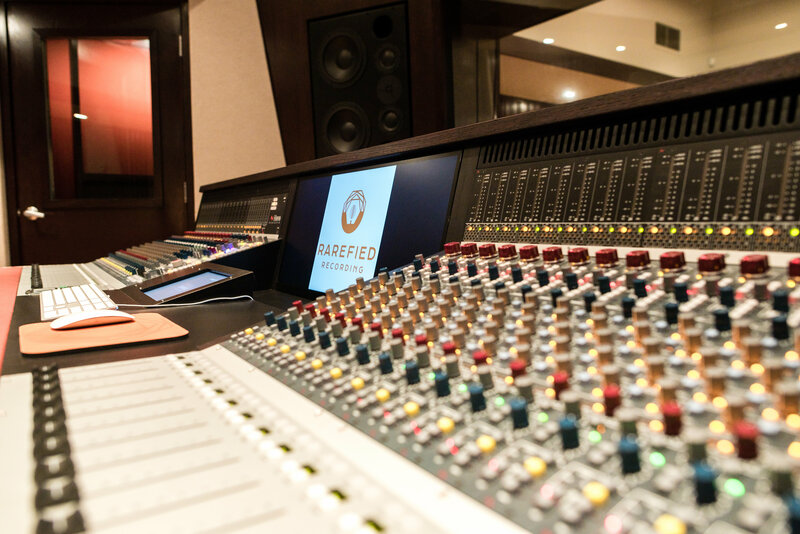 Rarefied Recording is a recording studio primarily used for music. I sometimes do voice-over/e-book/podcast stuff and rarely commercial jingles, but mostly I book local and regional bands recording original material. I offer recording, mixing, and mastering services, and if the project is right, I also produce. I know a lot of other producers and session musicians should you ever need them on your project. And if you have an engineer that you really like, I have no problem falling back to an assistant engineer role, allowing your preferred engineer to do the heavy lifting. In that case, I’m simply on hand to assist as needed and make sure your session goes smoothly. I don’t do photography or videography; however, I do partner with a videographer if you want to do an in-studio music video. I also periodically put on recording/mixing workshops with another engineer, Brian Scheuble. On the side, I consult with other studios and home recording enthusiasts about their setups, patch bays, wiring, etc. 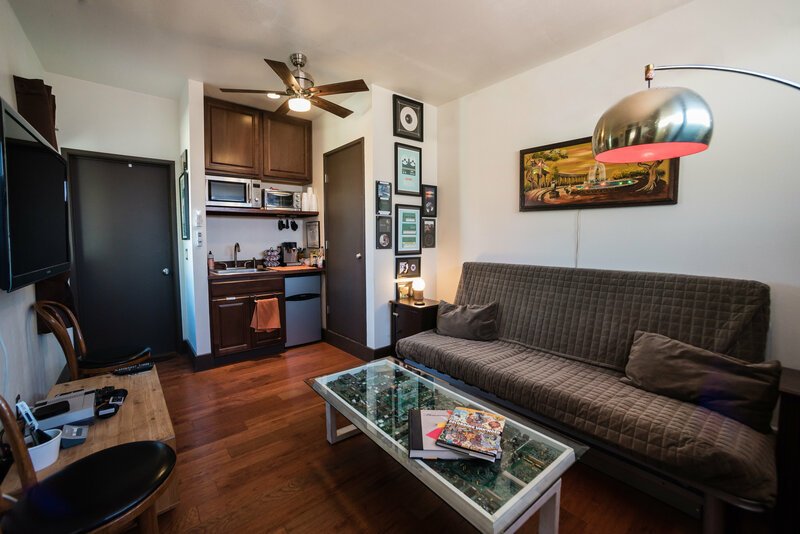 Rarefied is known as one of the most thoughtfully designed and well-built studios in the area. 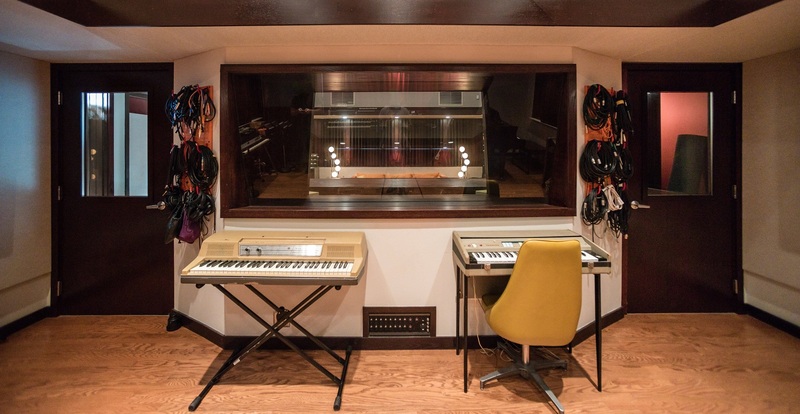 While there are some notable exceptions, many studios in San Diego are existing spaces that have been treated with acoustic materials to improve their sound. 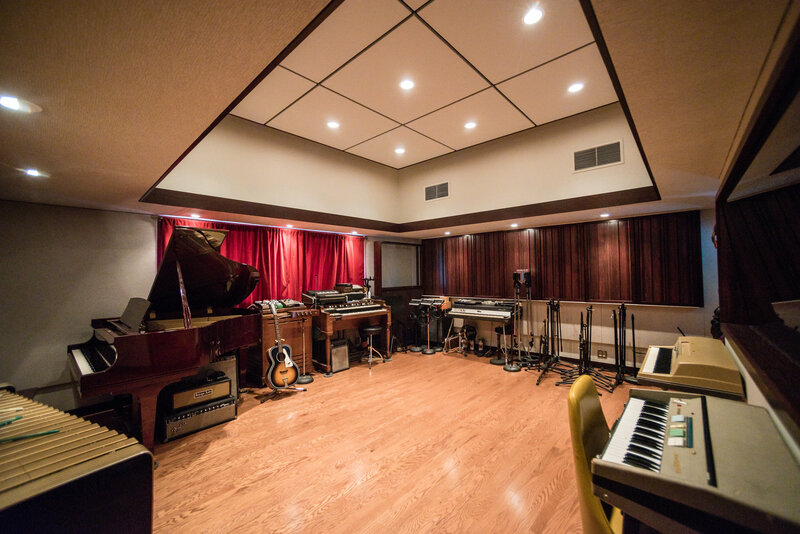 Good recordings can be made in all sorts of environments, but Rarefied does have something above the norm in this area since it was designed by a pro studio designer and built from the ground up by professionals. 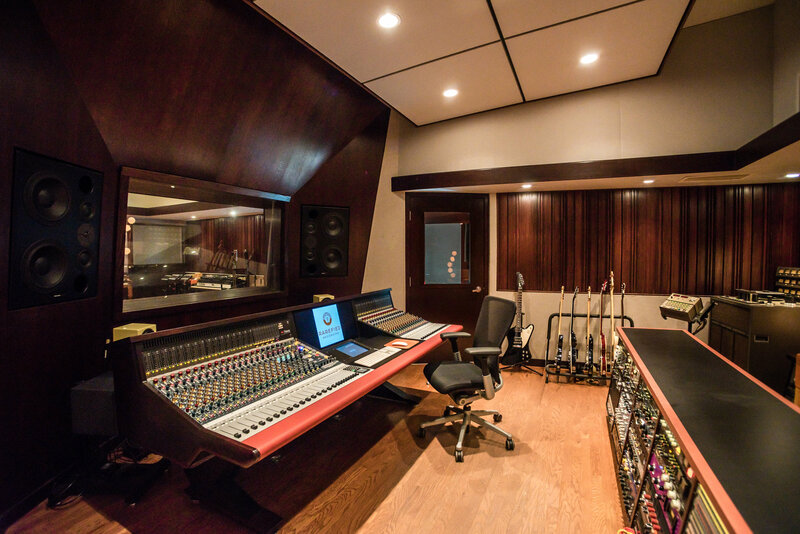 It’s especially apparent in the control room where the accuracy of sound is paramount. If you can’t properly hear what the mics are capturing, you will have some surprises later on when you listen back to other systems. To match the architectural excellence of the studio, I’ve been upgrading the equipment as time goes on. 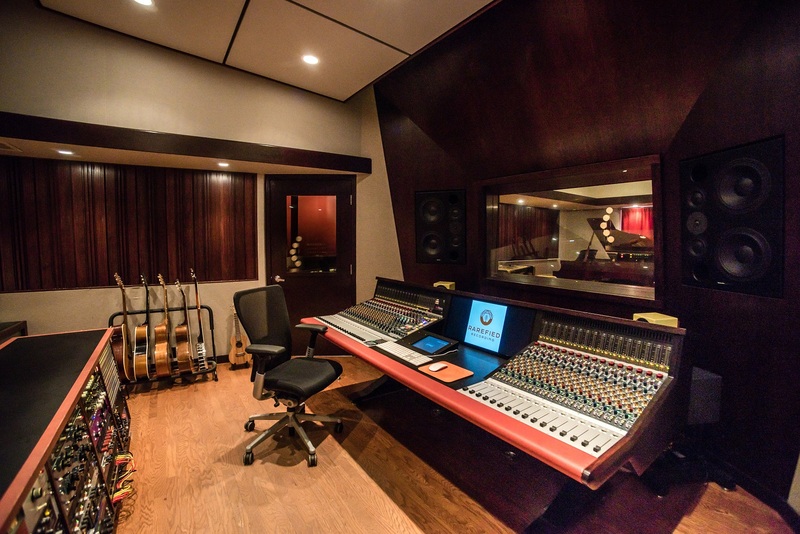 The centerpiece of the studio is a 32 channel AMS-Neve Genesys recording console. This is one of two Neves that I know of in commercial studios around San Diego (the other being a ten channel side-car at Studio West). If you don’t know anything about Neve, it’s a brand synonymous with high-quality and exceptionally musical sound capture. Just watch Dave Grohl’s “Sound City” documentary, and you’ll understand! Besides the mixing board, Rarefied is well appointed with modern and vintage microphones, compressors, equalizers, reverbs, delays, and external microphone pre-amps. I also have a wide variety of guitars, basses, stompboxes, amplifiers, and keyboards including a baby grand piano, Hammond organ, Fender Rhodes, and Wurlitzer electric piano. All of this wonderful acoustics and pieces of gear mean nothing without two more elements- a space with a good vibe and an engineer with the skills and taste to bring out the best in your music. During the design phase, I was very cognizant of how the space would feel in the end to my clients. I wanted them to feel comfortable and inspired when they stepped in the studio. So every wood tone, paint color, fabric, flooring element, and lighting element was carefully chosen to add up to a holistic environment that’s warm and cozy. One of the most common comments I get is how beautiful and engaging the space is so I think I met my goals! As far as engineering goes, I’ll have to let my work speak for itself, but my objective for every project is to bring out the best in the music. I approach things more from a sonic vibe/texture angle than anything else. I strive for big, full sounds that are present, warm, and never harsh. I spend a lot of time on each mix, searching for the best way to present the recorded audio; the way that aligns with the story or feeling the song is trying to convey. For mastering my motto is “do no harm.” I constantly check the master against the mix to make sure that whatever I’m doing is helping reinforce what’s great about it without compromising any aspects of the mixing engineer’s hard work. One thing that I’m very proud of is that despite the top shelf quality I offer my clients, I am able to keep the rates very affordable. Let’s face it- budgets are not what they used to be in the music business, but I want the studio to be accessible to the average musician who is largely self-funded. I keep a low overhead by handling all business aspects myself (from booking to post session clean up) and by carefully avoiding racking up any amount of debt. I guess you could chalk it up to the DIY spirit I’ve had since high school. I pass these savings on to the client so you can have that world-class studio experience without breaking the bank. Just like The Habitat, I see Rarefied as part of the music community in San Diego. 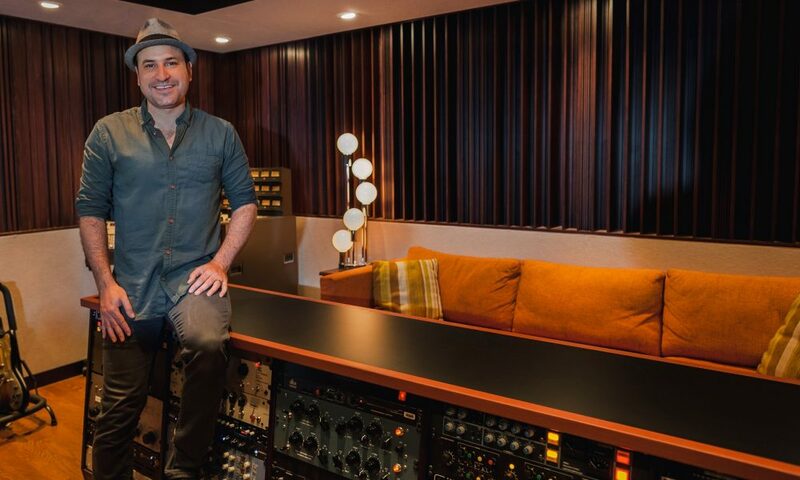 I consider it a community resource and am proud to be able to offer my space to musicians and guest engineers at a price point that is fair for everyone. I would have to say that it really was quite something the day I left my corporate job and went all in with the studio. Qualcomm was very good to me for 14 years, and I have much admiration and respect for my co-workers and the management there. But it was a very proud moment to be moving on, putting all of my efforts into my passion for recording.